The term postal specialties carries wide connotation in the post office related product industry. Some would include the term to include commercial mailboxes however for simplicity sake USA Building Supplies applies the words postal specialties to mean postal unique products that do not fall under other classifications. USA Building Supplies offers a two door outdoor pedestal parcel locker to meet your increased package deliveries. The pedestal parcel locker is built with the same security features as the F Series cluster box unit. 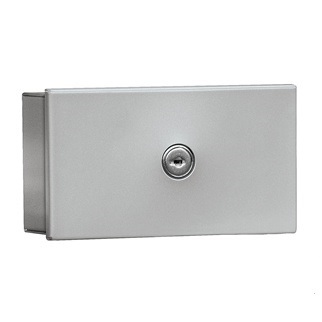 Durability is all but assured with the unit manufactured from 300 series stainless steel aircraft aluminum. USA Building Supplies' pedestal parcel locker is all but guaranteed to blend into your surroundings with the offering of six different powder coat finishes. 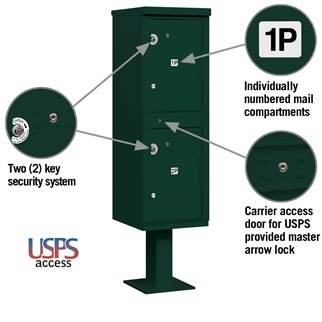 The parcel locker is designated for packages only with its two lock post office certified system. The package locker module is 62 ¾"H x 16"W x 18"D. The parcel locker module has two compartments that are 12"W x 19 ¾"H x 15"D. In addition, the mail carrier and or private owner (if private access) has a master entry door to access either compartment at once. Standard parcel locker doors are identified with metal decals marked 1P, and 2P respectively. The two door outdoor pedestal parcel locker is a perfect add on for communities that have been overwhelmed with package deliveries due to ecommerce. Pedestal parcel lockers eliminate unwanted trips to the Post Office. USA Building Supplies has universal NDCBU pedestals to repair your outdated Neighborhood & Delivery Box Units (commonly called NDCBU). The NDCBU was the USPS Approved cluster mailbox on a pedestal until the late 1990's decade until the USPS required cluster box units. The NDCBU was a rear loading unit and the mail carrier had to leave their mail truck to deliver the mail. The Postal Service and the marketplace also felt there were other shortcomings of this pedestal mailbox. The security, durability, lack of parcel lockers in standard units, and smaller tenant size doors were all reasons the marketplace demanded a change to the USPS Approved pedestal mailbox. The major manufacturers including Florence, Bommer, and Salsbury along with U.S. Postal Service collaborated to create a new pedestal mailbox known today more commonly as the cluster box unit. However, plenty of the old style NDCBUs still remained in the field and the Postal Service needed to make a decision on what customers were allowed to do as the NDCBU aged. The USPS decided that the NDCBU pedestal mailbox could be repaired but must be replaced with a cluster box unit. This transitional time in the pedestal mailbox marketplace lead many manufacturers out of the commercial mailbox industry, thus the industry consolidated. Hence, the need for universal NDCBU pedestal was needed as a temporary solution for aging NDCBU pedestal mailboxes. 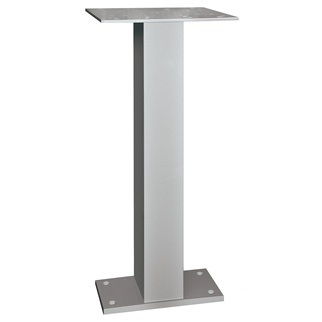 The universal NDCBU pedestal with its multiple drill hole pattern mounting plate will work with nearly all models in the marketplace. Contact a USA Building Supplies professional today to see if we can provide temporary repair to your mailbox.